If you work in an industry where you have clients then you may have felt the unrelenting sting of forgetting their contact information at some point or another. The free Client Contact List is here to make sure that never happens again. For most salesmen, their clients are their source of income. Forgetting their contact information takes the ball out of their court so you can no longer pursue that client and you’re forced to wait for them to come back to you. By downloading this free template, you can easily store thousands and thousands of clients in one place. To get started today, simply download the free sheet and follow the directions below. To download the free template file to your computer, you can follow the link at the bottom of this page. Next, open the document and follow the directions below. 2. Now go to the “Contacts” sheet. Enter customer ID, company name, contact person, contact type, phone, cell, fax, email. 4. Will require macros to be activated, to activate macros: File > Options > Trust Center > Trust Center Settings > Macro Settings >Enable all macros (nor recommended….can run). The free document is intuitive and simple to use. 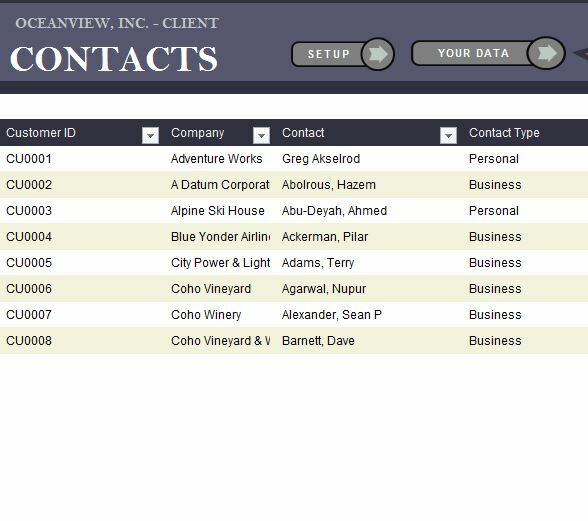 All you need to do is enter your contact information in the cells displayed in the examples given. You have everything you need to keep your contacts nice and organized. You can even search for them using the filters above each column. This way, if you have hundreds of numbers, you can quickly find the one you need.